"This is a great summer salad and will taste even better the next day...if it makes it overnight!" Cook spaghetti in boiling salted water until al dente. Rinse in cool water, drain. In a large bowl place chopped tomatoes, green bell pepper, onion and cucumber. Add Cheddar cheese, and salad seasoning. 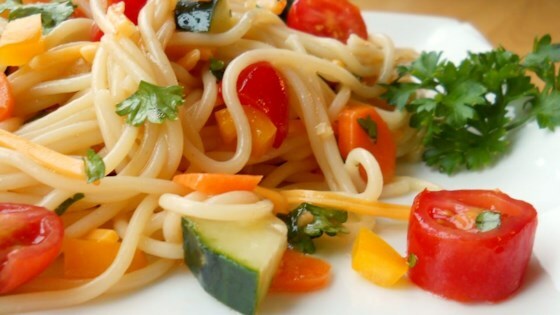 Add cooled pasta to large bowl with vegetables and pour salad dressing over top. Toss well to coat. Chill for several hours before serving. Prepared as directed. Good points - relatively quick, easy to prepare, filling meal. So-so point - lacked something in the flavor dept. Don't know that I'd try this one again. Wow...I loved this recipe. The only changes I made was to use penne pasta instead of spaghetti, and feta cheese instead of cheddar. I will definitely make this again! this is a very good pasta salad. i would use less bell pepper, and grate the onions so its less chunky. i also use parmesan instead of cheddar. Everyone loved this recipe. This makes plenty enough to snack on all week. I didn't change a thing about it. This makes a ton of Pasta salad! Tastes great the next day! I used Kraft light dressing.